The quantities below should enable you to make 6-8 amuse bouche servings or can be a nice little starter for 2 people. If you’d rather make this as a main like in a spaghetti vongole, just multiply the quantities as required and swap the pasta shells out for whichever pasta you prefer. Follow the instructions for cooking your pasta. 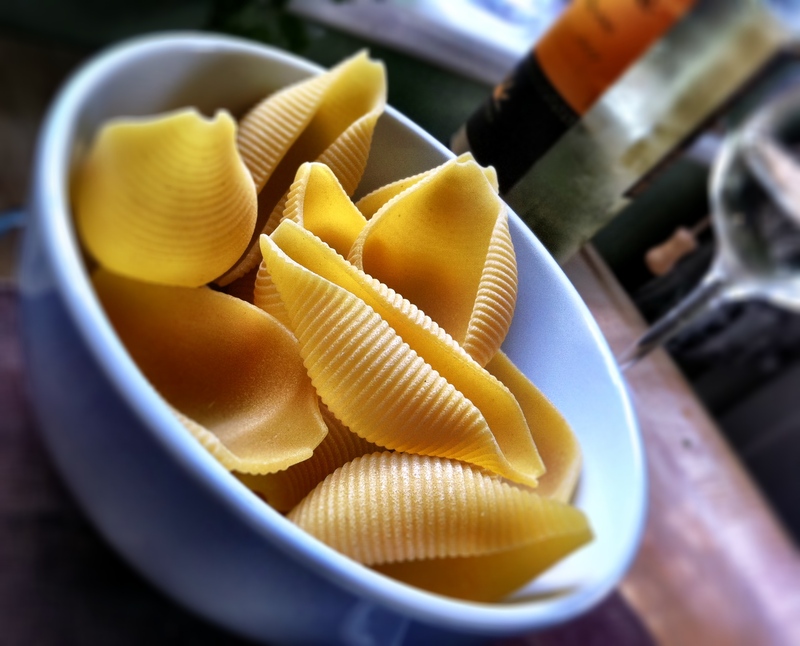 Five minutes before your pasta is ready, heat a saucepan with 1 tablespoon of olive oil. Gently fry the garlic until they’re just turning golden. Add your clams, fry for one minute before adding the parsley and white wine to cook or another 2 minutes. Add lemon juice to taste and season with salt and pepper. Cook for another minute and turn the heat down to the lowest setting to stay warm while you deal with the pasta. Once you’ve drained the conghiglioni, spoon some of the clams into each pasta shell, making sure you get some of the cooking liquor into the shell as well. Drizzle the tops with some good extra virgin olive oil and serve. 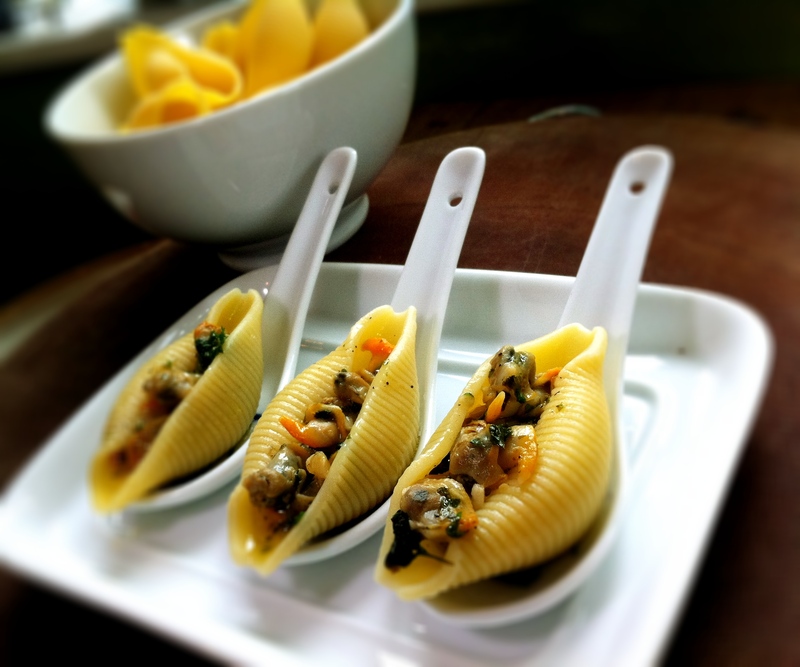 These amuse bouches are a great little starter if you’re planning to serve a seafood dinner. 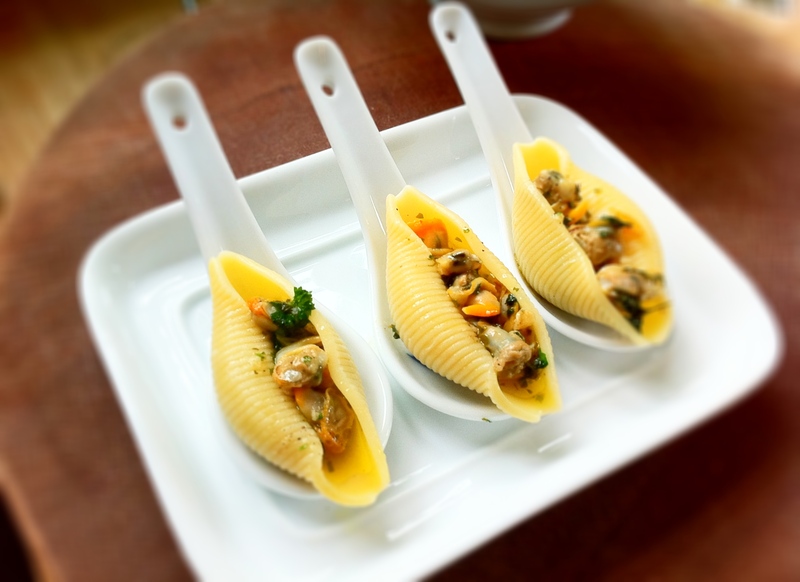 I can’t decide what I like better – the way the pasta shells mimic the shape of the spoons, or the idea of clams and garlic. I wish you could have seen all the clam shells that we found when we went to Easton’s Beach, Rhode Island..they were huge! If we could have harvested the clams we’d have had a great dinner, except the hubby is strictly a meat and potatoes man.